Perhaps now Stipe Miocic will get his just due. The Strong Style Fight Team lynchpin kept his stranglehold on the Ultimate Fighting Championship heavyweight throne with a clear-cut unanimous decision over consensus No. 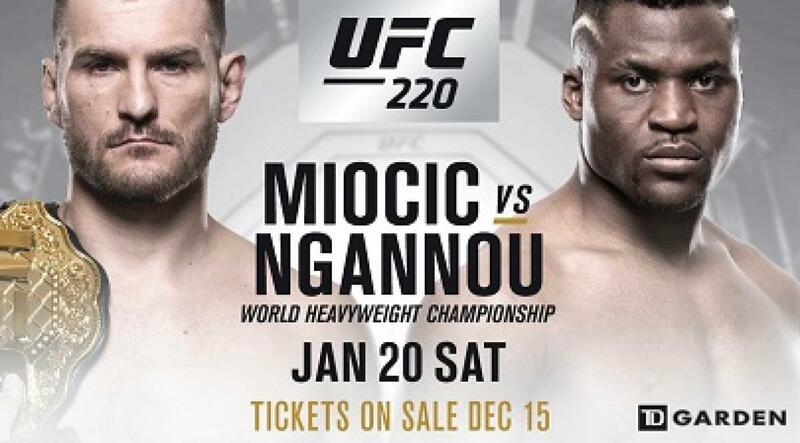 1 contender Francis Ngannou in the UFC 220 headliner on Saturday at the TD Garden in Boston. All three cageside judges scored it 50-44 for Miocic (18-2, 12-2 UFC), who became the first fighter in history to successfully defend the heavyweight title on three consecutive occasions. Ngannou (11-2, 6-1 UFC) cracked the champion more than once with right hands in a compelling first round, but his wild swings did not net the desired result and instead came at a high price. By the start of the second, the challenger was badly fatigued and far less explosive. Miocic turned to takedowns and clinches from then on, drowning the Cameroon-born Frenchman with the rinse-and-repeat tactic. Ngannou’s situation went from bad to worse to downright nightmarish, with Miocic either feeding him ground-and-pound or forcing him to carry his weight on all fours. The championship rounds offered little in the way of intrigue, as Ngannou had difficulty with the most rudimentary of movements, his 10-fight winning streak dying with a whimper. Daniel Cormier retained his undisputed UFC light heavyweight championship and did so in one-sided fashion, as he disposed of Volkan Oezdemir with punches in the second round of their co-main event. Oezdemir (15-2, 3-1 UFC) wilted 2:00 into Round 2. Cormier (20-1, 9-1 UFC) withstood an early assault from the aggressive Swiss upstart, slowed the pace and cracked him with a left hook that resulted in significant damage to the Henri Hooft understudy’s right eye. He followed with a takedown, advanced immediately to Oezdemir’s back and cinched a rear-naked choke in the closing seconds. The bell saved the challenger but only prolonged the inevitable. Cormier struck for another takedown in Round 2, moved to the mounted crucifix and cut loose with short punches until referee Kevin McDonald had seen enough. The setback was Oezdemir’s first in nearly four years. Team Sityodtong export Calvin Kattar put away the previously unbeaten Shane Burgos with punches in the third round of their featured featherweight scrap. Burgos (10-1, 3-1 UFC) bowed out 32 seconds into Round 3, as he experienced his first professional defeat. Kattar (18-2, 2-0 UFC) set the pace with a punishing jab throughout the first round, oftentimes doubling up on the punch. Burgos was undeterred and answered with heavy punching combinations upstairs, brutal shots to the body and strong inside leg kicks. At the start of the third round, the tide appeared to be shifting in his favor. However, Kattar wobbled the Team Tiger Schulmann standout with a fight-altering right cross. He followed with a pair of crushing right uppercuts and trailed the fallen Burgos to the mat, where a burst of rights and lefts prompted the stoppage. The 29-year-old Kattar has rattled off 10 consecutive victories. Former Ring of Combat champion Gian Villante put the brakes on a two-fight losing streak, as he eked out a split decision over Francimar Barroso in a three-round light heavyweight feature. Judges David Ginsberg and Mike Mena scored it 30-27 for Villante, while Dave Tirelli saw it 29-28 for Barroso. All three rounds followed a similar pattern. Villante (16-9, 6-6 UFC) marched down the Nova Uniao representative with punches, forced him to fight off the back foot and pushed him to the fence, unloading with power punches in combination while mixing in a few leg kicks along the way. Barroso (19-7, 4-4 UFC) invested in kicks and punches to the body but too often settled for single strikes and never managed to slow down the Bellmore Kickboxing Academy standout. Team Sityodtong’s Rob Font wiped out Thomas Almeida with a head kick and follow-up punches in the second round of their bantamweight showcase. Almeida (21-3, 5-3 UFC) succumbed to blows 2:24 into Round 2, as he lost for the third time in four appearances. Font (15-3, 5-2 UFC) was the aggressor from the outset. He pressured the former Legacy Fighting Championship titleholder with power punches and fed him a steady jab throughout the first round. Almeida started to turn the tide late in the frame but saw his momentum stymied by a chopping right hand in the second. The impact sent him crashing backward, and he never fully recovered. Font stayed busy and had him reeling again with a pair of right uppercuts before blasting him with a head kick along the fence. More uppercuts deposited Almeida on the canvas, where hammerfists from Font sealed the deal. The 30-year-old Font has won three of his last four fights. GEFC - GLOBAL. May 5, 2018. Baku. Azerbaijan. Pavel Kusch Vs. Hayder Hassan co-headline Phoenix 6. Dmitry Poberezhets signed a contract with the International League of ACB MMA.